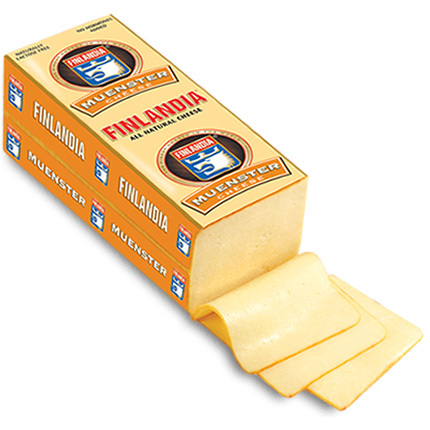 Finlandia Imported Muenster is a mild, creamy, full-bodied cheese. Its gentle and distinctly tangy flavour is sure to give sandwiches a unique taste everyone will enjoy. Our Muenster is made from the purest milk in the European Union and aged to perfection. It is naturally lactose free and made with no hormones, since the use of Rbst or other growth hormones is not permitted in Finland. Finlandia Imported Muenster is the first and only imported Muenster and it is here now for you and your customers.